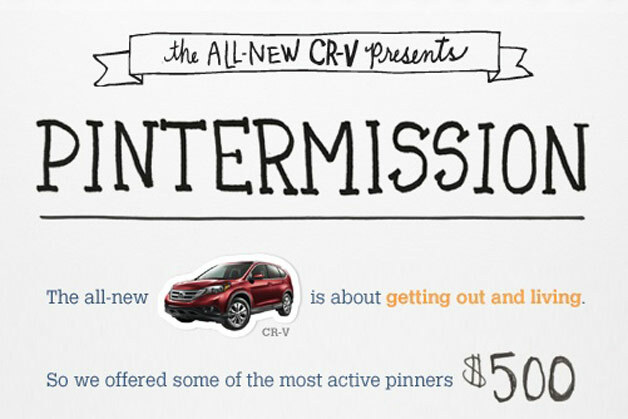 The Auto Marketing Blog: How Did Honda's Pintermission Perform? Most of us in social media are fairly tired of writing POVs on whether a brand should be on Pinterest and the resounding response from many companies is 'yes we should and here are some boards to prove it.' 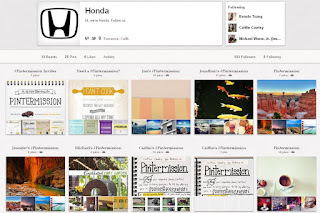 Honda is one who decided to make an early entry on Pinterest. 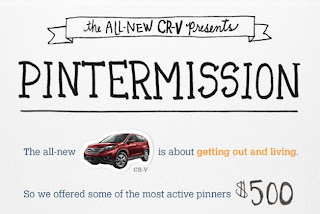 They built their brand boards around the current launch of the 2013 Honda CR-V, but instead of leaving it to a few well posed pictures of a car in various scenes Honda decided to apply their campaign idea in a fun and unique way on Pinterest. The current campaign talks about "What's on your leap list?" What's a "leap list"? It's basically a bucket list but without the morbid implication you should do x things before you die. Good idea to change it from bucket list as one's mortality isn't really the inspiration for buying a utilitarian vehicle like the CR-V. Here is a TV spot showing a grandmother and grandson taking a drive to where grandma grew up. It's a charming story of getting out and exploring one's world and family roots. At the core of the idea, it's all about getting out into the world and experiencing fresh air and a bit of adventure. So where does Pinterest fit in? With all of the excitement happening online with Pinterest, Honda developed the idea of a #Pintermission, where one takes a break from online and gets out to live life to experience more than pinning things. I love the idea here because it turns the excitement of a new social media platform into something tangible and still relates to the message of the campaign. The Pinterest effort launched a month ago and that seems like enough time to see how it did. Before we get into the numbers I should caveat that I never expected anything big here. What was significant is the coverage this simple execution received in the advertising a social media publications and blogs. That in and of itself was a win because now Honda is seen as a solid case study of what a brand can do on Pinterest, beyond just create a few boards and call it a day - basically what most other brands seem to be doing. For those wondering how many CR-Vs it sold, I would venture a guess of zero. So for the ROI crowd this isn't a a good use of time. The branding crowd however will find some benefit here since it shows Honda is paying attention to social trends and found a playful, meaningful way to fit it into their new vehicle launch. There's little doubt it generated some positive brand impressions from people on #PinChat and others who love this new social platform. Finally from a PR perspective it worked brilliantly after getting some good media coverage showing earned media works well when the idea is creative, there's a new technology to be innovative on, and it's a social platform gaining a rapid audience. Impressive? Got me. This is a new platform and there really isn't much to benchmark from on the site. I will add that of all the metrics publicly available on Pinterest, Repins is the best indicator of successful content. I say this because repins show someone else finds a post personally relevant enough to include it on their personal board. To end, this was a beautifully executed idea that fit with the Honda CR-V marketing campaign. Want to see more of the creative? 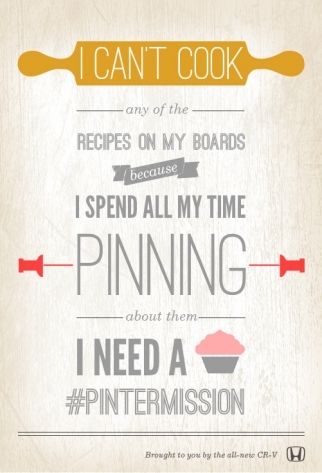 Checkout all of Honda's #Pintermission posters on AdWeek. I have been playing around with Pinterest and Tumblr for my gourmet ice cream sandwich client. One thing my client with a limited budget has wanted was publicity outside SoCal but hasn't had the $$ to really pay for this. And what I found was that I could generate some awareness outside of their market because both platforms had communities that were national/worldwide. I am an ROI person. But I also know that there is no ROI if no one knows about your brand or product. One thing that is REALLY hard for the car folks is real life trumps online or TV commercials. I LOVED the hamster hoodlum Kia Soul commercials. But the car is dorky in person. And the TV spots are aimed at young hipster adults. Yet in upstate NY which as one of the biggest Kia dealers in the US I have never seen anyone under 45 driving one. My point being Pinterest can generate a lot of views and impressions and activity but once that car rolls out and I see it and the drivers my view of it will be made by that vs anything on any boards or social media network. This made perfect sense for the CR-V, but does it impact the rest of the brand? If I flip around online and see Honda pushing CR-Vs to recipe seekers - what am I going to think of the brand as a whole? The same company that built one of the greatest two-seat roadsters, that would rev to high heaven is now targeting housewives looking for cupcake recipes online. Doubtful. Most brands have full portfolio of vehicles appealing to all kinds of demographics. Plus it's not as if Honda is trying to promote its brand image as the Ultimate Driving Machine which is where a brand could have issues with campaigns like this; though, even that is negligible with an effort as small as this.